Youth Club is for 8 to 12plus over the past twelve months we have painted, sung, played drums, pool, air hockey, table tennis , had a pottery workshop (see below) ate loads of grub and generally had fun. Starting at 6.30 pm on a Wednesday evening, we now finish at 8 pm. A Good Sing Up at the Grove was had by all! Meadow Way Youth Group joined with other groups to sing to a packed audience at the Wider Opportunities Celebration Concert organised by Bedfordshire Music on 9th June at the Grove Theatre, Dunstable. Local groups from Bedfordshire schools and youth groups came together to celebrate their work this year. 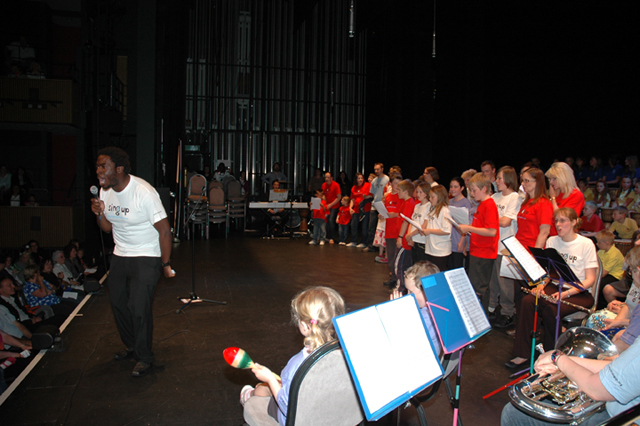 Instrumental and vocal groups collaborated to produce an entertaining evening of music.